The federal government will contribute $6.6 million to deepen a second container berth at the Port of Baltimore’s Seagirt Marine Terminal, according to the Maryland Port Administration. The federal grant will combine with a $7.8 million state grant and $18.4 million from Ports America Chesapeake, which operates the Seagirt Marine Terminal for the port administration, bringing the project funding to $32.7 million, according to the Maryland Port Administration. The second berth will be deepened to 50 feet — the same depth as its twin, which was opened in 2013 at the 50-foot depth. The second berth has a depth of 45 feet now. The additional 5 feet depth is key because it enables the Port of Baltimore to handle supersize vessels, according to Maryland Port Administration spokesman Richard Scher. That means handling giant containerships such as Neopanamax vessels that have cargo capacity of more than 14,000 TEUs, or industry-standard 20-foot-equivalent units. What added the urgency to the deepening is the expansion of the Panama Canal, which finished in June 2016. The improved Panama Canal, which cost more than $5 billion, included construction of a new set of locks on the Atlantic and Pacific sides of the waterway, creating a third lane of traffic for more cargo especially from East Asia headed to the East Coast. That gives shippers, retailers, manufacturers and truckers more logistics and supply-chain options. Now each major port on the East Coast with eyes on that traffic seeks to welcome the big ships with deeper ports, wider channels and bridges that don’t get in the way. “This is a bit of an arms race,” Scher told Transport Topics. And one victory was scored earlier this year when the Port of Baltimore welcomed the largest containership to visit Maryland, the 11,000-TEU Gunde Maersk, in October after leaving from China the month before. The stakes are high. The Boston Group and C.H. Robinson estimated in a June 2015 report that 10% of container traffic between East Asia and the United States could shift from West Coast ports to East Coast ports by the year 2020. So the scramble is on for the Port of Baltimore to keep up with competing East Coast ports in Norfolk, Va., and Charleston, S.C. The Baltimore port has a variety of uses and terminals now, and it has been the No. 1 auto port for seven years, Scher said. In 2017, the Port of Baltimore saw a record 596,972 containers make their way across the port’s piers. Through October 2018, containers are 5% ahead of last year’s record pace, according to the Maryland Port Administration. 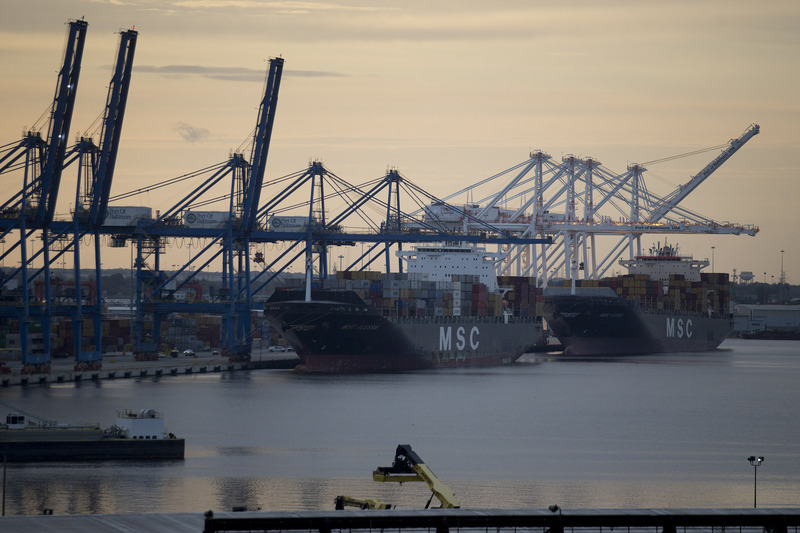 The Port of Baltimore also gets a lot of bulk minerals, such as salt, said Aaron Ellis, spokesman for the American Association of Port Authorities. Sugar, fertilizer, dry grains, break bulk, dry bulk, liquid bulk, refrigerated goods, and passengers on cruise ships all come into the Baltimore port. But attracting ships carrying such things as cars and sugar had not been the competitive dilemma. The port wants to attract more big containerships, Scher said. “Almost anything you can think of can be placed in a container,” Scher said. And from ports go the goods, often by trucks. Thus, industries see opportunity in intermodal connections. AAPA’s annual report said for the nation’s ports to remain efficient and competitive during the next decade, more than $20 billion will be needed to improve multimodal and rail access. The association forecast that U.S. ports and the private sector would spend $155 billion during the next five years to expand terminals and make infrastructure improvements. “We’re very pleased [Baltimore] got this grant,” Ellis said. The federal funding is from a U.S. Department of Transportation’s Better Utilizing Investment to Leverage Development program. Baltimore’s port construction is scheduled to begin in the second half of next year and should take about one year to complete, according to Scher.